The E-Connectivity Listening Session Sept. 20 in Denver, CO, was an opportunity for broadband providers and the people who use—or would like to be able to use—broadband to provide input on how to improve services in rural America. If you missed the session, you can watch the webcast here. This session is part of What’s on the Horizon for E-Connectivity in Rural America, a project organized by Farm Foundation, in collaboration with CoBank, NTCA-The Rural Broadband Association, National Rural Electric Cooperative Association, the National Rural Utilities Cooperative Finance Corporation, and the U.S. Department of Agriculture. “The four listening sessions in this projected focused on identifying the challenges rural communities now face in providing quality broadband services, as well as the innovative options being used to address those challenges,” explains Farm Foundation President Constance Cullman. Two panel of regional leaders discussed e-connectivity needs and the partnerships and solutions now being used to enhance broadband services in rural communities. Panelists were: Randy Wheelock, Commissioner in Clear Creek County, Colorado; Brian Shepherd, COO of Colorado Broadband Office; Brian Tagaban, Director of Governmental Policy with Sacred Wind Communications Inc.; Jon Saunders, COO of SECOM, a division of Southeast Colorado Power Association; and David Shipley, General Manager of Rye and South Park Telephone Company. Comments and discussions from all the sessions will be the basis for a report to be provided to federal and state public and private leaders to better inform their decisions regarding improvements to, and expansion of, broadband services in rural America. More than 225 people–including 175 viewing the live webcast–participated in the Aug. 16 listening session in Birmingham, Ala. This session was at the Alabama Center for Advanced Technology and Training on the campus of Lawson State Community College, Birmingham, Ala. View the entire session at THIS LINK. Steve Foshee of Towbigbee Energy Cooperative, Jake Cowen of Troy Cable, and Fred Johnson of Farmers Telecommunications Cooperative joined Farm Foundation President Constance Cullman to discuss broadband needs at the Alabama listening session. The Alabama session began with comments from Anshu Vaish, CEO of Robin Health, Macon, Ga., and Alabama farmer Will Gilmer of Gilmer Dairy Farms. A second panel discussed specific challenges and opportunities for improving e-connectivity in the region. Panelists were: Fred Johnson, Executive Vice President and General Manager of Farmers Telecommunications Cooperative, Rainsville, Ala.; Jake Cowen, Chief Financial Officer of Troy Cable in Troy, Ala.; and Steve Foshee, President/CEO of Tombigbee Electric Cooperative, Hamilton, Ala. Open mix sessions were provided after each panel. The listening session concluded with an update from Washington, D.C., by Jannine Miller, Senior Advisor for Rural Infrastructure at the U.S. Department of Agriculture. The second session was June 19 in Faribault, Minn. Video of that session is available. U.S. Secretary of Agriculture Sonny Perdue and Federal Communications Commission Chairman Ajit Pai joined executives from the five partner organizations April 18 in Washington, D.C., to kick off the listening sessions. Perdue and Pai both highlighted the importance of e-connectivity to all sectors of rural America. At the Upper Midwest Listening Session June 19 in Faribault, MN, about 50 people provided perspectives on the availability of service and options for delivery. Bill Esbeck, Executive Director of the Wisconsin State Telecommunications Association, joined Steve Fenske, Attorney and Government Relations Manager with the Minnesota Association of Townships, to discuss e-connectivity needs in the Upper Midwest. Innovative solutions now being used to deliver broadband were discussed by three Minnesota officials: Kristi Westbrock, CEO/General Manager of Consolidated Telephone Company (CTC) of Brainerd, MN; Danna MacKenzie, Executive Director of the Minnesota Office of Broadband Development; and Brian Zelenak, CEO of the Mille Lacs Energy Cooperative, Aitkin, MN. U.S. Secretary of Agriculture Sonny Perdue and Federal Communications Commission Chairman Ajit Pai joined executives from the five partner organizations April 18 in Washington, D.C., to kick off the listening sessions. Perdue and Pai both highlighted the importance of e-connectivity to all sectors of rural America. Executives from regional telecommunications companies participated in the April 18 session, to provide perspectives on the broadband service issues. 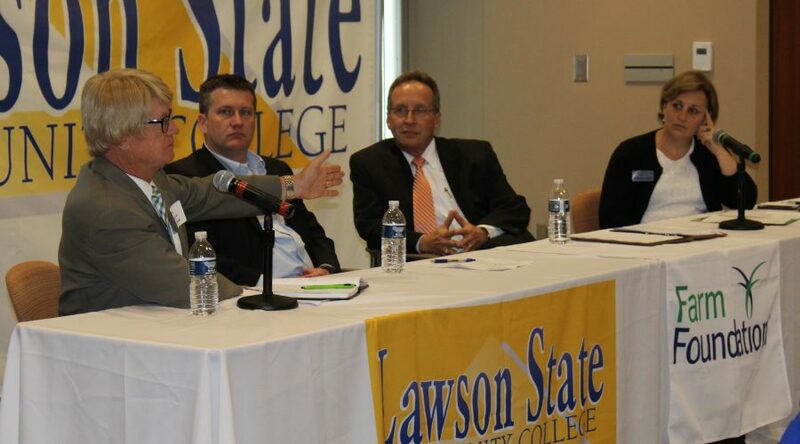 Thie panel included Levoy Knowles of the Tennessee Telecommunications Association, Mel Coleman of the North Arkansas Electric Cooperative, and Ken Johnson, Administrator of Rural Development’s Rural Utilities Service.